March is Disability Awareness Month in Indiana. Each March, Disability Awareness Month is celebrated throughout Indiana. And given that adults and children with disabilities represent slightly more than 19 percent of Indiana’s population, disability awareness is important for all of us. 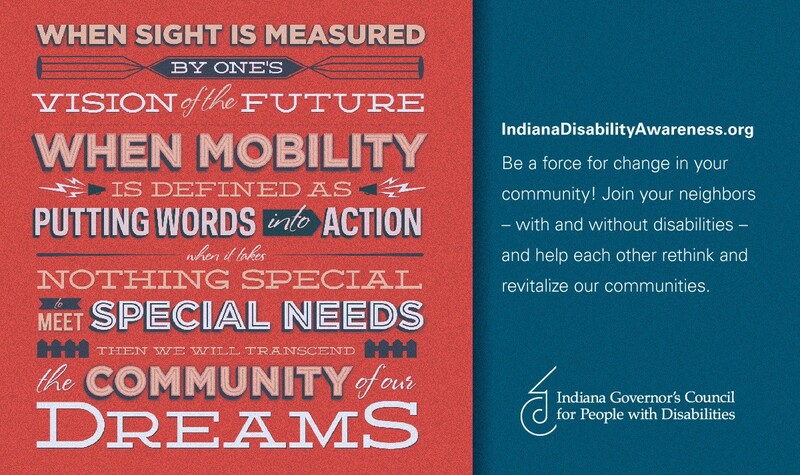 Led by the Indiana Governor’s Council for People with Disabilities, the goal of Disability Awareness Month is to increase awareness and promote independence, integration and inclusion of all people with disabilities. The Council develops a unique theme for this annual event and produces campaign materials that are available free of charge to Hoosiers who want to help make a difference. The 2014 campaign theme is “Dream to Dare,” which inspires and encourages all of us to challenge each other to rethink and revitalize our communities. This year’s poster uses a simple, but meaningful, poem to frame our attitudes toward what we all want to achieve—communities that are sustainable, accessible, economically viable and encourage civic and social engagement for all. The text at the bottom of the poster challenges us to “be a force in our community” by learning more about smart growth as we rethink and revitalize our communities. This is the 24th year for Disability Awareness Month. Won’t you join thousands of advocates and people with disabilities across the state by conducting community-based activities? Activities include events such as mayoral proclamations; art and essay contests; and awareness campaigns in schools, businesses and government agencies. See a list of activities below and contact information for how YOU can get involved! Thanks in advance for your efforts to help raise awareness and understanding of disability issues in your home, business, school or neighborhood! Events during the month of March and April to celebrate! 2014 Diversity Works Business Recognition Ceremony – March 27th, 2014 – 2:00 pm to 3:30pm – Fountain Square Ballroom. Eleven area businesses will be honored for outstanding support of employment for individuals with disabilities in our community over the past year. This event is free. See the honorees and more information on the invitation here. Living with Autism: Diagnosis, Education & Treatment – April 1st, 2014 – 4:00 pm to 6:00pm – City Hall Council Chambers. A panel discussion will take place moderated by LIFEDesigns CEO Susan Rinne. This event is free. Light refreshments will be served. See panelists and more information on the poster here. 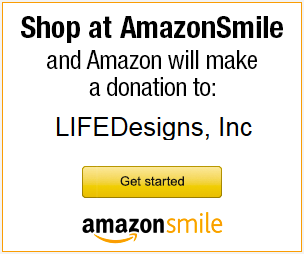 LIFEDesigns is hosting a drawing and essay contest for students in Kindergarten through 8th grade. Are you a student? Please contact your teacher for more information about how you can participate. Are you an educator? Please contact Leslie Abshier, labshier (at) lifedesignsinc.org or 812-332-9615 ext: 218, to find out how your students can participate. Do you want someone from LIFEDesigns to come present to your employees about disability awareness? Please contact Leslie Abshier, labshier (at) lifedesignsinc.org or 812-332-9615 ext: 218, to find out how you can book us for a FREE inclusion and disability awareness educational training on your schedule at your place of work. Also, follow us on Twitter, “Like!” us on Facebook and read our *NEW* blog to learn more about disabilities and what is going on this month to bring awareness to our communities!